EU Foreign Policy Chief Federica Mogherini will meet with foreign ministers from the UK, France and Germany today to discuss the future of the Iran nuclear deal after the US president announced his intention to withdraw from the accord. According to Mogherini, the deal is capable of surviving without US support as long as Iran continues to agree to stand by it. 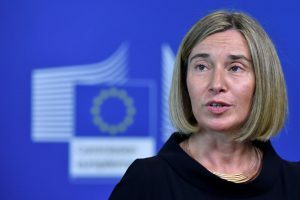 So far China, France, Russia, Britain, Germany and Iran remain in the deal; Morgherini claims she has received assurances from the Iranian government that it intends to uphold the deal. However, the US withdrawal seriously jeopardises the legitimacy of the agreement. Even if the US desire to renegotiate a new deal is actualised—a prospect Iran has dismissed—it is unlikely a new agreement could be reached soon (the original deal took 12 years of talks). With the EU-US relationship under strain from the ongoing disputes over possible US tariffs on EU steel and aluminium imports, the divide over the Iran deal is another blight in the historic political and economic alliance. From the economic perspective, watch for how European companies like Renault, Volkswagen and Fiat-Chrysler with plans to invest in Iran react to US plans to resume sanctions against the Islamic Republic.